Ken Shiro (R) pressures Melindo. Milan Melindo's latest opponent Kenshiro Teraji or Ken Shiro has held the WBC light flyweight title since May 2017, and was previously the OPBF light flyweight titleholder in 2016. Shiro's father is Hisashi Teraji, also a boxer who won the OPBF light heavyweight title. Shiro previously defeated two other Filipino boxers namely Lester Abutan by 3rd round TKO on December 2016 successfully defending his OPBF light flyweight title and Rolly Sumalpong by unanimous decision on October 2015 for the vacant WBC youth light-flyweight title. Melindo failed in his try to become world champion again last Sunday, October 7, when Ken Shiro stopped him in the 7th round to retain his WBC light flyweight crown in Yokohama, Japan. Melindo was not floored, but the fight was stopped at 2:47 of the round due to a cut over his left eye after receiving several jabs and punches in the earlier rounds of the fight. The 26-year-old Shiro was ahead, 59-55, on all the three judges' scorecards when American referee Laurence Cole stopped the bout upon the recommendation of the ring physician. The 30-year-old Melindo shone only in the 2nd round when he hit and shook Shiro with a strong overhand right. All the other rounds were dominated by the taller and swifter titlist, considered as one of Japan's elite champions. 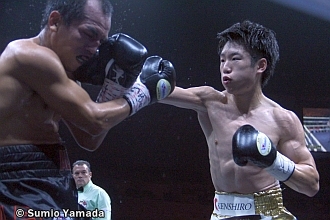 Shiro improved to 14-0 with 8 KOs in his fourth title defense. Melindo, the former IBF light flyweight titlist, dropped to 37-4 with 13 KOs. Last New Year’s Eve, Melindo lost to WBA champion Ryoichi Taguchi in a title unification match. He shocked Japan last year with a first round knockout of Akira Yaegashi to wrest the IBF title in Tokyo. Tyson Fury said he will retire as unbeaten heavyweight champion like Rocky Marciano. Fury (27-0, 19 KOs) told Deontay Wilder (40-0, 39 KOs) that it is "written in the stars" that he will beat the American when both undefeated fighters meet in the ring for the WBC heavyweight title at the Staples Center in Los Angeles on December 1. This will be the third bout after Fury made a comeback, defeating Sefer Seferi and Francesco Pianeta. He was inactive in the ring for two and a half years. On June 2016, the rematch with Wladimir Klitschko was postponed to a later date due to Fury's sprained ankle injury. On the same day, Tyson Fury and his cousin, Hughie Fury, were charged by UK Anti-Doping allegedly with presence of a prohibited substance from a sample taken in February 2015, which the two boxers heavily denied. On September 23, Fury again postponed the fight after being declared medically unfit. Fury said he had depression problems after a being tested positive for cocaine. WBA super middleweight world champion Rocky Fielding (27-1, 15 KOs) is positive he can get a knockout win over Canelo Alvarez (50-1-2, 34 KOs). Canelo will make his New York City debut when he faces Fielding on Saturday, December 15 at Madison Square Garden. Fielding, 31-years-old, has scored six victories in a row since suffering a first round knockout loss at the hands of Callum Smith. In July, he pulled off his career-best win with a knockout of Tyron Zeuge to capture the WBA "regular" title at 168-pounds. Aside from being the current WBA (Regular) super middleweight champion, Fielding is a former WBA intercontinental super middleweight champion, as well as former British, Commonwealth and English super middleweight champion. He was born in Liverpool, Merseyside, England and was originally named Michael. But because of his 10 lbs. birth weight his father called him "The Rock." Giannis Antetokounmpo is already considered an MVP candidate and the 6-foot-11 star's chances are boosted this season, with the hiring of former Hawks head coach Mike Budenholzer. He had revisions for the Milwaukee Bucks team plays which could improve further Antetokounmpo’s unlimited talents, while possibly upgrading the team's achievements. Antetokounmpo was born in Athens, Greece, the son of immigrants from Nigeria. Nicknamed the "Greek Freak" due to his superb strength and agility, he essentially plays forward, but could also play guard with ball-handling skills extraordinary for a towering player. During the 2015–16 season, he became the Bucks' main playmaker. In 2016–17, he was Milwaukee's leader in all five major statistical categories and became the first player in NBA history to finish a regular season in the top 20 in total points, rebounds, assists, steals, and blocks.